An early start saw me pulling the curtains to see the silhouette of jagged and towering mountainsides a stone’s throw from the balcony. Despite the drifting banks of fog, occasional glimpses of the awe inspiring scenery whetted the appetite for the day to come. As this was our first excursion, we were a little unsure about the arrangements. On cruises and excursions we’d done before on a different cruise line, we’d always been given a meeting time and place where they sign you off on a list and assign you to a group before leading you down to the coaches. However, P&O’s approach was much simpler and the tickets said to get off the ship at a particular time and go straight to the coaches. This worked really well and members of the ships staff were on the quay directing people to the right coaches. The local tour guide was a nice chap and gave a relaxed and informative commentary as we went along. 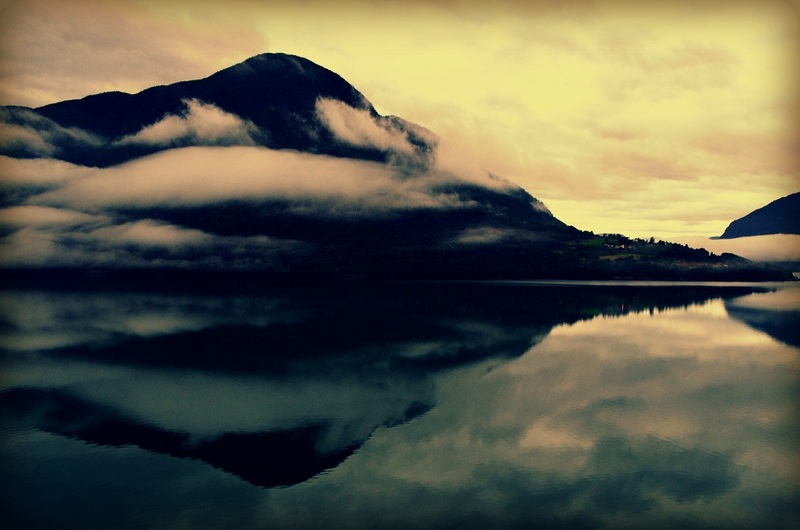 The weather started out very miserable and low cloud hung over the fjord obscuring the views. Fortunately the further inland and up the mountains we went, the more breaks in the weather there were. The weather was kind to us as we approached the first stop. The clouds broke and the sun came bursting through to reflect brightly off of the distant glaciers and ice flows that we had paid a sizeable chunk of money to see. And boy was it worth every penny! Although we were a couple of miles from them, the scenery and spectacle was still breathtaking. The awesome power of Mother Nature was abundantly clear in the ravaged and fractured rock faces that had been carved out over centuries by the glaciers during the ice ages. 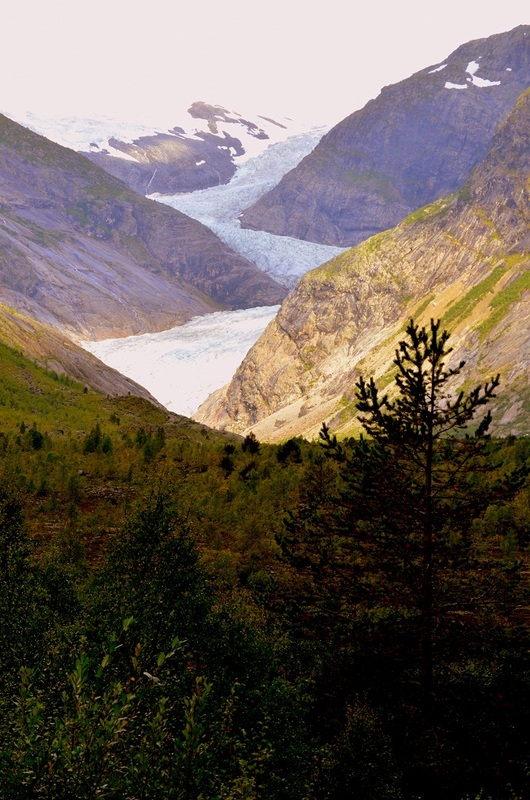 If the first stop was breathtaking, the next even closer to the Briksdalbreen Glacier was something else. The scale of everything changed and what had been impressive in the distance suddenly seemed ten times bigger and ten times as impressive. The turquoise tinged ice flowed right down to the edge of the fjord and looked almost unreal. Time seemed to stand still as we admired this alien landscape and despite there being several coach loads of people there too, it was incredibly peaceful. We made one more stop to view another glacier from a distance through a colourful mountain valley. The wind here was blowing with some force and everyone was covered head to toe in the little white seeds that were being carried in the breeze. The drive back to the ship was picturesque and relaxing with mountain streams, winding roads and the now clear view across the fjord. Back on-board we enjoyed a late lunch and an afternoon nap to recharge our batteries and it was soon time to wave goodbye to the stunningly beautiful Skjolden. Just before departure there was the unusual occurrence of an announcement being piped into our cabin. P&O don’t usually do this and expect you to tune in to the telly when you hear an announcement start outside your cabin. This is all well and good, but by the time you’ve found the remote, fumbled around getting the telly to come on and eventually got the right channel; you’ve missed the important bits. Or you can open your cabin door and hear it on the speakers in the corridor…not the done thing if you’ve just been having an afternoon nap in just your underpants, though! The message started ominously and sounded like it was going to be bad news and it was. The Captain told us that the call to Geirangerfjord the next day had been cancelled. This was due to the fact we would have to venture back out of the fjords into the open sea to navigate up to the next fjord and there was a force 8 blowing with seas of 8-10 metres. Now, I’ve been on another big ship in a force 10, gusting 11, with bigger seas than that and it was not a problem. A bit lumpy. Sure. But nothing these mighty ships can’t handle admirably usually, so I was very perplexed and disappointed by the Captain’s decision. Especially as I quite enjoy the ride on a big sea. So, instead of a pleasant evening sailing along and out of Sognefjord, we would be making a very short trip down the fjord, stopping overnight at Flam. Arrangements had been made to provide a limited excursion program, but obviously all existing bookings for Geirangerfjord were cancelled. 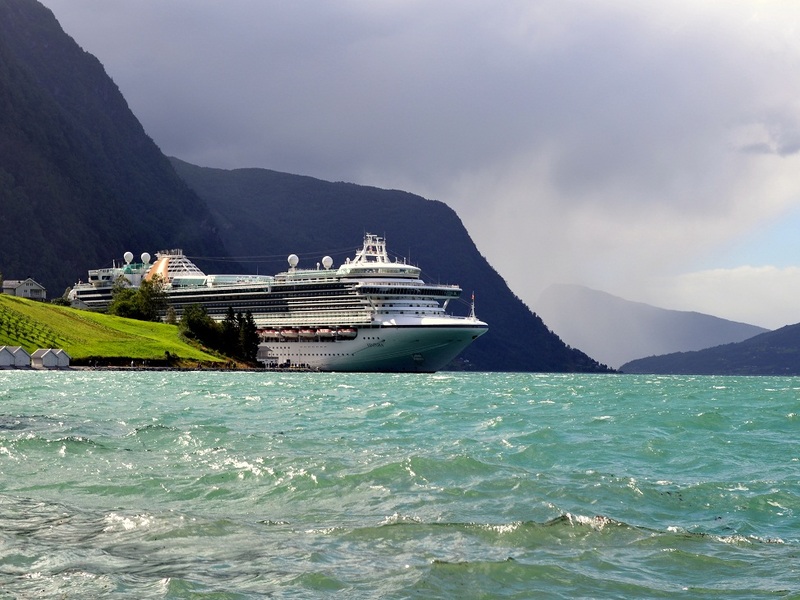 Those who had already booked for Geirangerfjord were given no preference and booking was a free for all. Two of the three revised excursions were much more expensive than the original ones and the other was very similar to what we’d done in Skjolden, so we passed and opted to make our own plans for the day. The news put a bit of a dampener on proceedings and there seemed to be a lot of miffed people about. I heard several voicing the same opinion as me; that a ship this size could easily have handled the conditions. As if to rub salt into the wounds, the weather started closing in before we’d even cast off our ropes and the beautiful scenery soon started to disappear behind the low clouds and mist. Spirits were lifted again, however, by the brilliant Freddie Mercury tribute act in the evening theatre show. Vocally superb and camper than camp, Steve Larkins also had all the right moves and injected a big dose of good humour into his performance. Musically, the ship’s house band, The Electrix, revelled in pumping out Queens’s rousing rock anthems and I was amazed at how accurate their rendition of the iconic Bohemian Rhapsody was. By now we’d been alongside at Flam for a few hours and the ship was eerily still and quiet except for the howling wind and horizontal rain thundering down outside. Many will no doubt have had a much more relaxed sleep thanks to the Captain’s revised sailing plan. Personally I missed the motion of the ocean rocking me to sleep. All in all it was still an absolutely amazing day, with some unforgettable scenery and some great entertainment on the ship. 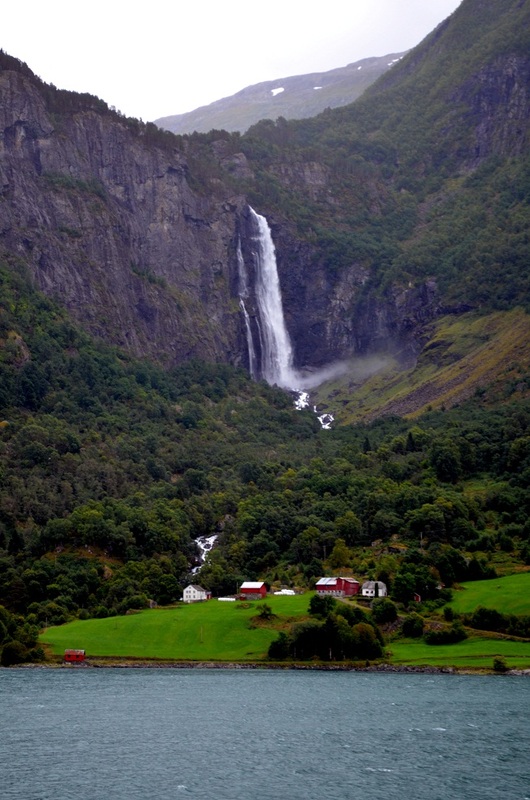 It was time now to explore Flam….